We just received a copy of Tobin Gilman’s new book entitled, “19th Century San Jose In a Bottle,” and we have to say it’s a terrific effort and well worth adding to your bottle library. Gilman leaves no stone unturned as he focuses in on San Jose, California with its sunny climate and long growing seasons. Although a booming metropolis now, San Jose was once a relatively moderate sized town as he writes about the different individuals who participated in not only the production of glass and bottles, but the forefathers of a town that has become one of the largest populated areas in the Golden State. The book begins with a heartfelt “In Memoriam,” to the many boys and other lives lost on a November 1900 day when a seemingly panoramic view of the Stanford-Cal football game soon became a trap door to chaos as the roof of the San Francisco and Pacific Glass Works Factory roof they were sitting on, gave way, with a number of the hundreds of people falling to their deaths, some into the fifteen tons of molten glass boiling 40 feet beneath them. A newspaper article depicts the event proclaiming the loss of 13 lives and 78 injuries. As the book continues we learn some history of San Jose, a dirt paved city before the 1890’s with a population of 21,000 in 1900, to becoming the third largest city in California and the 10th largest city in the country today. Gilman points out that since San Jose was a relatively newer California city compared to the likes of Sacramento or San Francisco, they began by adhering to the “new,” laws of the land in regard to drug stores. Under the new Pure Food and Drug Act passed in 1906, Gilman explains that, “It would be unfair and misleading to categorically link the San Jose druggist community with the notorious turn of the century quack medicine purveyors.” Gilman is very thorough discussing men like Augustus G. Schoenheit proprietor of the City Drug Store who moved to San Jose and worked in California’s first drug store as a druggist. Schoenheit later purchased the store and renamed it State Pioneer Pharmacy. Of course there were other druggist like Nathaniel Carson, Charles Fischer, R.J. Rhodes and many others who took their place in drug store trade. Most of these early druggists left behind their legacy in glass, bottles with their name or drug store on them. 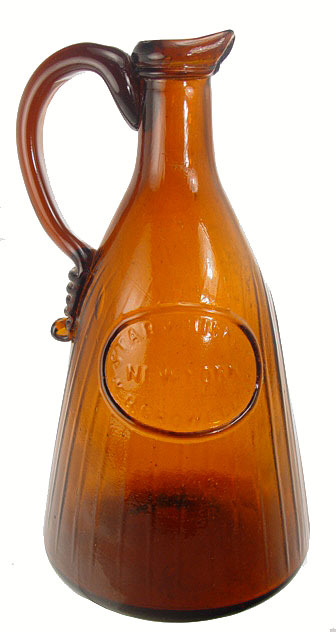 Gilman pictures a cobalt blue bottle with the name Keating and Babb in his book which he considers the most desirable of the San Jose drug bottles. Gilman points out that not much is known about Keating or Babb, another business gone the wayside. The bottles have been known to sell at auction for over $1,000. We are aware of a Jeffries Babb who arrived in San Francisco in 1851 but other than that the trail ends there. Gilman covers primarily drug store bottles, sodas and mineral waters and beers with a mixture of other bottles near the end of the book. Anyone with interest in bottles from the San Jose area will be treated to a mixture of chronological history along with a number of photographs beautifully done by photographer Joel Gringorten and some studio shots by Ron Shirley Studios, Courtesy of Frank Dutro. Also included are pictures from the era some showing the inner workings of the glasshouses and the mixture of men and boys who worked in them. Other pictures show Main Street and the controversial San Jose Electric Light Tower looking very similar to the Eifel Tower in Paris which later became the subject of a lawsuit. Ironically it was San Jose who unsuccessfully sued the builders of the Eifel Tower for copying their design. As interesting as the city of San Jose is depicted, the book is about bottles and Gilman goes into great detail outlining the expansion of the city and of course the bottles and the proprietors who had them made. Santa Clara County happened to be in an area encompassing a dozen natural springs which wasn’t overlooked by creative entrepreneurs like Darius Ogden Mills and Alvinza Hayward, already self-made millionaires. They saw the potential in the mineral rich springs and together they started Saratoga Pacific Congress Springs. The company bottled and sold their water across the country and before long created a resort where people could come and bathe in the waters and enjoy the beautiful Santa Clara valley with its sun-filled skies and laid back atmosphere. It provided a relaxing alternative to the cold winters elsewhere across the country. 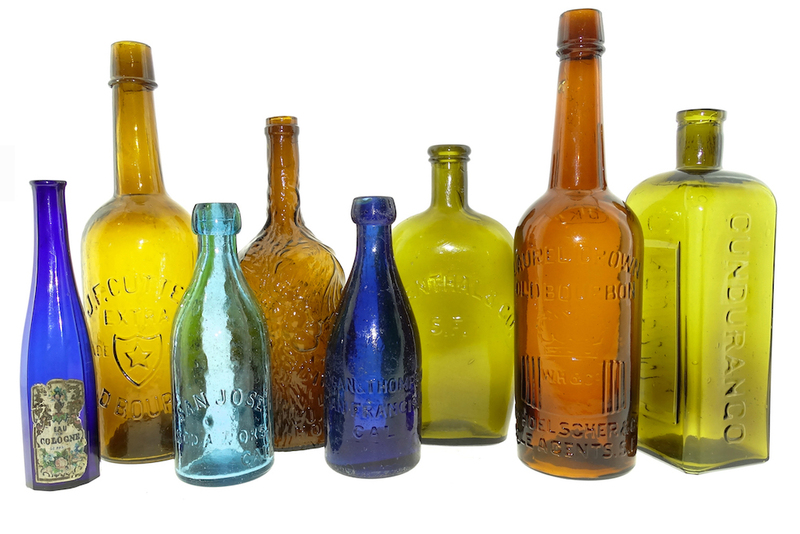 The bottles they had made are highly desired by collectors today, some with a running deer and multitude of colors. There are a number of beautiful photographs of many if not all of the “sodas and mineral waters,” rivaling the quality of any bottle photographs we’ve seen. The breweries were another source of income for these young pioneers and The Fredricksburg Brewing Company started their operation as early as 1869. At the time it was thought to be the largest brewery west of the Rockies. The Santa Clara Brewery, Rudolph Scherf, C.J. Vath and others all got involved in the making of beer and offered their brews throughout the state. Bottle collectors will recognize these names embossed on bottles, many of them made at the San Francisco and Pacific Glass Works. Pictures of the breweries and the people who ran them are also pictured in this entertaining look at this enterprising city. Long before San Jose became known as part of Silicon Valley, it was called the The Valley of Heart’s Delight due to its plentiful supply of fruits. Fruit jars were a logical if not necessary ingredient in the booming orchard rich city. At first they were made of crockery but after John Landis Mason introduced a canning jar with screw threads with zinc lids and glass in transparent colors in order to better see the contents, the home canning craze took off. Interesting to note, it was the Ball brothers who purchased the rights to the Mason jar patented in 1858 and soon it was the barometer by which people aspired to do their own canning. Names like Kerr and Atlas joined in the boom which lasted from the late 1800’s until the mid-1900’s. By 1892, The Santa Clara County Fruit Exchange incorporated, bringing in small neighborhood associations from all around the area to have their fruit put up and sold on the open market. In building a warehouse with canning machinery to sell pre-jarred products, the Fruit Exchange offered easy access to various fruits which was now becoming a way of life. Soon after, numerous other companies joined in and it changed the way people ate forever. With a 365 day a year growing season, homes could enjoy Bing cherries and other delicious summer fruit in the winter and keep an ample supply in their kitchen cupboards and larders. In the final chapters Gilman looks at other bottled products like olive oil and whiskey. Pala Grove offered a premium oil and Ferdinand Brassy whiskey which both had produced bottles with their names embossed on them. Collectors today know how lucky they are to obtain a Brassy San Jose flask as they are one of the more sought after western whiskey flasks. By 1907 Brassy employed twenty people and his headquarters was capitalized at $100,000. Brassy was also involved in helping build the street car line connecting the Willows district with downtown San Jose. He was also a director for the First National Bank. So it goes; the story of a small town, headed towards untold wealth. With their rich agricultural heritage and beautiful weather conditions, today San Jose is more known for the next greatest boom in this country’s history by way of the computer. Although most people in this country think of California as Hollywood, the Golden Gate and its beautiful City by the Bay, a small town named San Jose had their own exclusive niche in the world market. Today if you drive through the area it never seems to end. With its multitude of towers and new industrial plants, San Jose is leading the way into the 21st Century. Who would have thought a small town first founded in 1777 but largely undeveloped for 150 years, would lead to the rapid growth of the high-technology and electronics industries further accelerating the transition from an agricultural center, to an urbanized metropolitan area the way it has? So this story is about bottles but one can’t ignore the dramatic climb to its status as 10th largest city in the country today. 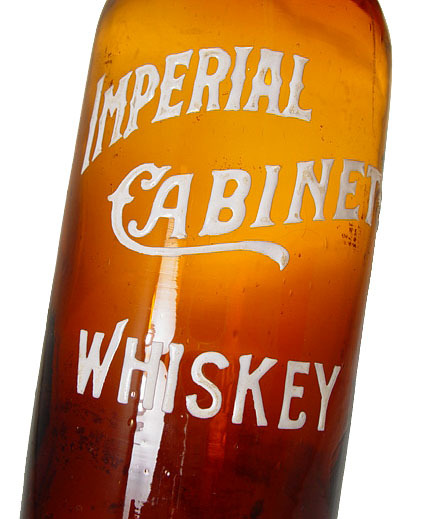 19th Century San Jose In a Bottle is a very interesting read as much for the well-researched study of its people who made, had made, and produced some terrific collectible antique bottles, but for the town itself. It certainly is as improbable as any story of any city in our country. And it’s just down the road from Sacramento. 19th Century San Jose In a Bottle can be purchased through the author, Tobin Gilman at tobingilman@hotmail.com or through Blurb Books at www.blurb.com or follow the book on Facebook https://www.facebook.com/19thCenturySanJoseInABottle for more information. A softcover edition is $35 and a hardcover is $50.00 plus shipping. a number of local drug store bottles. I would like to find out if you have local histories on these. and Curtis and Henkle Drug Co., San Jose – cobalt blue poison. Hi Jeff, applause and kudos to you for such a well written recap on Tobin’s new book, “19th Century San Jose in a Bottle!” Yes, to collect antique bottles is one thing, but to learn about the men/women, the stories and the places behind these old bottles, is to learn what makes “the West” and California so unique/great, and simply takes the hobby and our enjoyment of such things to yet another glorious level… and what a fascinating and clever way to “tell the story of San Jose” by way of our collectible bottles, like Tobin has so beautifully done in his book! 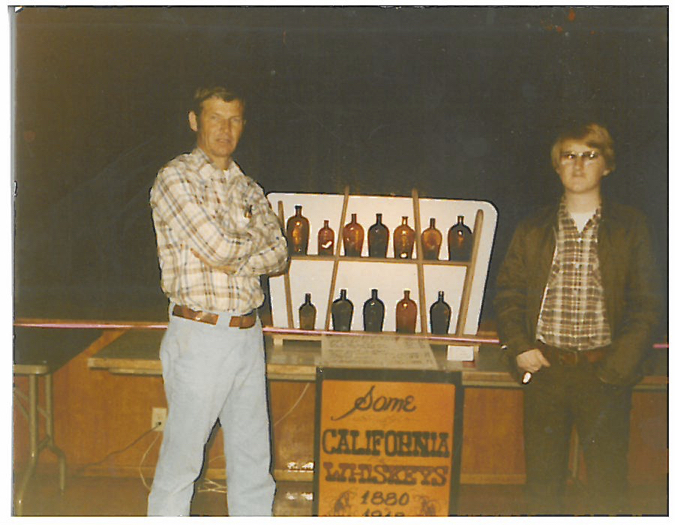 By the way, Tobin is one of the newer members of our San Jose Antique Bottle Collectors club (one of the first in California) and he is truly a great person. We are blessed to have him and he is a frequent contributor at our monthly meetings. Please do your self a favor and buy a copy of Tobin’s well done book. Roger Hill, Treasurer SJABCA, Western & Art Deco Soda Pop Bottle Collector Extraordinaire! Jeff, this is an excellent piece of research showing how multifarious the heritage of our local people is. I loved reading about your take on “19th Century San Jose In a Bottle”. You have cited some interesting facts about my forebears which I am now going to look into in a lot more detail. I know that my great grandparents, being Europeans in their childhood, have fond memories of collecting bottles in England and finding numerous pieces of pottery in the damp muddy conditions near the south coast there. I fear that the more arid climate we know and love has sadly taken away many such possible finds from us in Santa Clara and San Jose. Nevertheless, hope springs eternal!